Congratulations went to Pure Glass Greenhouse, which won the prestigious title of RHS Chelsea Garden Product of the Year 2017. The robust, frameless design broke away from tradition, maximising the amount of sunlight that can get to plants, and offered elegant design for gardens. Launched in 2011, the RHS Chelsea Garden Product of the Year competition recognises the best new garden products. Entries were judged on a number of criteria, including innovation, visual appeal, functionality, quality, value for money and environmental sustainability. 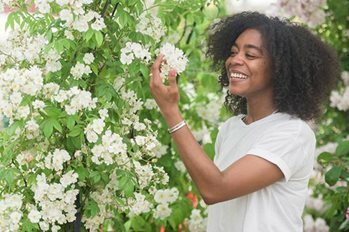 In 2017, 13 finalists were shortlisted to compete for the prestigious title, with all products available to buy throughout the RHS Chelsea Flower Show and online. Finalists were chosen from a number of entrants, all of whom were exhibiting at the 2017 RHS Chelsea Flower Show. The winner was chosen by a team of experts, including entrepreneur and BBC Dragons’ Den investor, Deborah Meaden. The ultimate in luxury lounging, the lounger was the perfect piece of furniture to inject fun into a home - a vibrant, inflatable chair, versatile for all gardens. A solid brass light, it was the perfect finishing touch to any stylish garden, and designed to stand the test of time. The compact, cordless, all-purpose saw provided easy, vibration-free sawing for both indoor and outdoor use. It used the world’s first NanoBLADE technology. The EasyCut 12 was extremely versatile and able to saw in two directions for precision. Successfully combining technical innovation and contemporary aesthetics, these high-quality metal planters and raised beds were engineered with kitchen gardens, urban settings and landscaping applications in mind. An ingenious, wearable trug that simply clipped to clothing comfortably, leaving people's hands free for harvesting and deadheading. Leda and the Swan was a sleek statue depicting the fabled seduction of Leda by Zeus in swan form at the conception of Helen of Troy. Handcrafted using Chilstone’s marble and resin mix stone, it was suitable for indoor and outdoor use. From its outdoor collection of dining furniture, the set was a brilliant blend of design and quality. Using durable European oak, the contemporary design featured two interlocking parts. Delivered flat and assembled on site for ease of access to terraces and smaller spaces. Created with felt made from recycled plastic bottles, Permafelt offered gardeners a product for plants to grow through, with weed control and moisture retention. Breaking away from tradition, the design was robust and frameless. Maximizing the sunlight to plants, the Pure Glass Greenhouse, made from 10mm thick glass offered an elegant design for any garden. Designed to reflect the sky and surrounding foliage, the beautiful sculpture was reminiscent of swaying crops. Featuring leaf-shaped pieces of mirrored stainless steel atop stems of oxidized steel, the dramatic piece uplights at night for impact. A simple and modern water feature, the Solus Water Dome provided a beautiful water bowl with clean curvaceous lines. For those who love to cook outdoors, this was the first quad-fuelled outdoor oven. Ideal for cooking pizzas and large joints of meat, as well as roasting vegetables and baking bread, the oven was made of high-grade stainless steel with a sleek design. With an integral self-watering system, a raised and easily accessible fabric planter that maximized growing space in small areas.